If you love colonial towns and want to experience the incredible Colombian nature, the Culture - Nature Tour is the perfect tour for you. You will see the difference of the life in small towns and big cities, learn about the colonial architecture in National Heritage Towns such as Barichara and Girón, and visit stunning viewpoints of unique landscapes. NOTE: The following description and prices of the tour are based on a 4-day visit. Please, take into account that we can offer a longer or shorter Culture – Nature Tour. Just contact us for your customized tour! NOTE: You have the possibility to upgrade the hotel for an additional cost. Let us know the type of hotel you would like to stay in and we will send you a quote. Arrival at the Airport Bucaramanga Palonegro (BGA) and transfer to your hotel in Bucaramanga. You will have time to get a shower and change your clothes in the hotel. After that you will start the city tour. The City Tour in Bucaramanga starts out with a short walking tour in the centre of Bucaramanga. 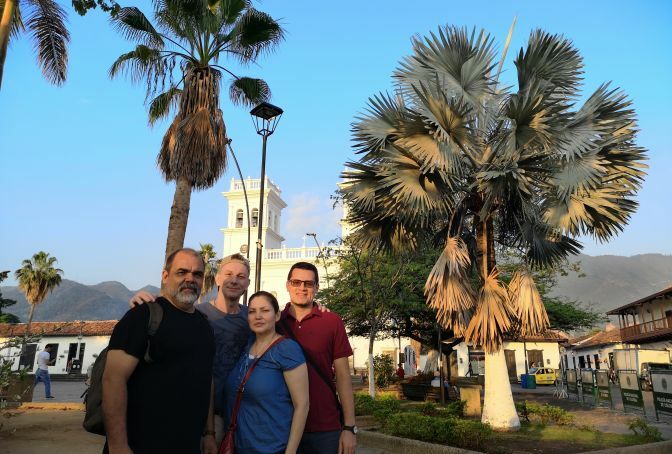 During this one-hour walking tour you will get to know the central park of Bucaramanga where the city was created, different government building, churches, a chapel. This tour will show you how Bucaramanga used to be in history and how it started to grow. You will also learn to understand the difference between a typical Colombian city and a small Colombian town. If there is still some time left after the walking tour, you will be free to choose whether you want to get to know Bucaramanga´s historical museum, walk through the shopping streets in the city centre where you will find cheap clothes, visit a fancier shopping mall or visit the part of Bucaramanga which is famous for its leather shoe production (no additional costs). After having lunch in Girón (lunch included) you will walk through the picturesque streets and pass by buildings with a typical well-conserved colonial architecture. Because of the architecture Girón was declared as one of 17 towns in Colombia as national heritage. In contrast to Barichara Girón is a busy city and you have the perfect setting to imagine how Colombians used to live here 200 years ago. You will spend about 2 hours in Girón. In order to reach the Eco Park Santísimo you will have to take a cable car from the parking lot that takes you almost 500 meters up the mountain. Arriving at the top you have a great view of the whole metropolitan area of Bucaramanga. The main attraction in the eco park on top of the hill is the Christ Statue Santísmo that has about the same height as the famous Christ Statue “Christo Redentor” in Rio de Janeiro, Brazil (27 m vs. 30 m). The great thing of the Santísimo is that you can take an elevator behind the back that even offers you a greater view. In addition, the park counts with various souvenir stores, a store where you can try self-made beer and wine made of oranges and raspberries, stands selling typical candies of the region and cafés. After enjoying a stunning sunset above the city of Bucaramanga (if it does not rain), there will be a light and water show in the park. Night Dinner We will provide you with the information about different options for dinner (dinner not included) and we will also provide you the transport to the restaurant. Before 8 am Breakfast and Check-Out Breakfast included in the hotel and check-out. You will walk the paths of the Hacienda El Roble, a coffee estate with more than 100 years of tradition of producing one of the world’s finest coffee (officially the most expensive coffee of Colombia). During the walk (approx. 1 hour) you will get to know the outside coffee museum including the coffee plants, the coffee planting and growing, and various types of coffee. After the walk you will arrive at the production facilities where you will learn about the different steps of the coffee processing. The tour will end with the coffee tasting where you have the possibility to taste the coffee grown on the farm and distinguish between the different tastes, aromas and attributes. The coffee farm is certified by the Rainforest Alliance, ensuring that Los Santos Mesa coffee conserves biodiversity and ensures sustainable livelihoods for 127 species of birds that can be found within the Hacienda El Roble. The completely organic coffee is grown under a dense forest canopy and is certified by BCS ÖKO-Garantie, a leading international certifier. After the whole tour and tasting you will have a delicious lunch at the guesthouse. Enjoy the cable car ride through the Chicamocha Canyon going more than 1000 meters down the canyon and up on the other side (total length 6,3 km; duration of the ride 30 minutes). Enjoy the unique landscape during the ride through the canyon which is with 2000 m even deeper than the Grand Canyon in Arizona, USA and has a total length of 227 km. The Canyon was formed more than 60 million years ago from what once used to be a great sea. Arriving on the other side of canyon you will be entering the Chicamocha National Park. The lower part at the cable car station is a tiny town representing the colonial town Barichara. Here you can find restaurants, shops, shops for souvenirs, a little chapel and the Guane Museum. The Guane Museum shows the culture of the indigenous Colombian tribe “los Guanes”, including information about their culture, items they used and even come skulls that show the cranial deformation. Going up about 100 stairs from the town you will arrive at the Santander Monument “Monumento a la Santandereanidad” which represents the first step of the Colombian independence. The monument is build upon a large tobacco leave which represents a very important economic element of the region. The monument shows angry statues that all appoint at the Spanish Empire since they wanted to gain their independence. The reason why the monument is located in Santander is that the first revolts for the independence of Colombia and other Latin American countries took place in El Socorro which used to be the capital of Santander. Walking up the hill for about 400 meters you get to the 360 degrees viewpoint where you can enjoy the majestic view on the canyon from different angles. Additionally to these 3 parts you will find different activities in the park such as canyoning, an extreme swing, ziplining, an ostrich park, virtual reality, buggies, a waterpark, etc. (not included in the price). Dinner will be provided before leaving the park or on the ways to Barichara depending on your hunger (dinner not included). Barichara, known as the most beautiful town in Colombia, is famous for its colonial architecture, the quiet cobbled streets, adobe houses and artisan workshops and its craft shops among other things. You will see amazing churches, chapels, graveyards, sculptures and parks. Also, you will be entering the stores where the handcrafted goods are made and sold. These handcrafted goods include baskets, paper, clothes, bags, shoes, little figures, dreamcatchers, etc. and are great souvenirs you can take back home. During the walking tour you will also pass by the fringe of the town where there is a stunning view of the Suarez Canyon. The fringe has various viewpoints and it’s a great place to have a drink and enjoy the view for a while. Noon Lunch in Barichara The lunch will be a typical Colombian lunch including the soup and the main meal and it will be offered in the backyard of a building in the style of the colonial architecture (lunch included). After lunch you will have the opportunity to enjoy the colonial streets of Barichara on your own where you could take more pictures or just sit down and relax. If you wish, you will also be able to walk a part of the Camilo Real, which is a trail that was build 150 years ago and has a lot of history. The total hiking trail is about 5 km long and takes you about 2 hours. You will have time to walk the first 20-minute part of the trail. This part offers you a great view into the Suarez Canyon and you will hear different bird during the hike which is mainly downwards. 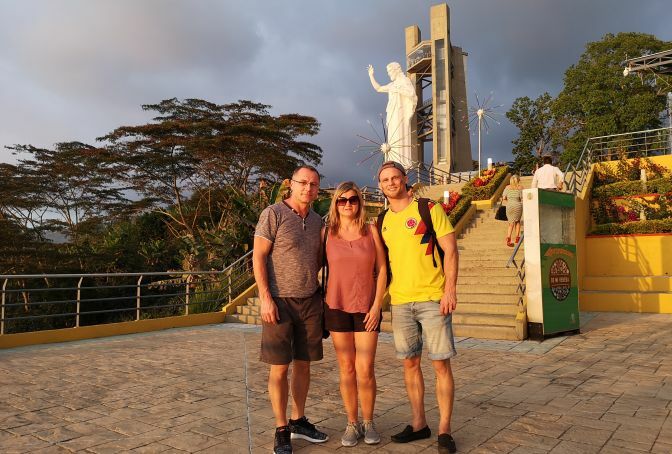 Another option is to start the ride back to Bucaramanga and stop in San Gil (30 minutes from Barichara) where you can enter the Parque Gallineral, a nature park that is famous for its beautiful local tree “El Gallinero”. The entrance to the park has an additional cost of about 3 US-dollars per person and is not included in the package. Morning Dinner We will provide you with the information about different options for dinner (dinner not included) and we will also provide you the transport to the restaurant. The tour can easily be organized with the transfer Villa de Leyva – Barichara on the first day. This means that order of the Day 1: City Tour and Day 3: Barichara would switch. The tour can also be organized departing to Villa de Leyva on Day 3. This means it is not necessary to stay an additional night in Bucaramanga. The additional cost for the transfer from or to Villa de Leyva is 500.000 COP for a group of 1 to 4 tourists (in a small SUV) and 900.000 COP for a group of 5 to 12 tourists. The Chicamocha National Park is closed on Mondays and Tuesdays. The Eco Park Cerro del Santísimo is closed on Mondays. Depending on the day of arrival we might have to adapt the order days to guarantee a successful tour. That would neither change the overall activities nor the price of the tour. Prices are listed in the following table (valid until Dec. 31, 2019). Foreign travelers must bring their original passports. Colombian residents receive a discount of 10%, but must pay additional 19% IVA (ARTÍCULO 481 DEL ESTATUTO TRIBUTARIO/ DECRETO 297 DE 2016). Regarding the transport, a group of 1 - 4 persons will be transported in a small-size SUV, a group of 5+ in a larger vehicle usually with a separate driver. If a group of 4 prefers a larger vehicle due to an excess of luggage, they will have to pay the price per person that a group of 3 pays per person. The prices in USD are based on our internal exchange rate of 1:2900 on November 23, 2018. The international exchange rate was at about 1:3200 on November 23, 2018. If the value of the Colombian Peso drops by 5%, the listed prices will not be valid anymore! Moreover, we do not carry any transaction costs. Prices increase by 10% in “High Season” which is between 15th Dez and 15th Jan, spring break (12th - 21st Apr), between 15th Jun and 22nd Jul, between 4th and 14th Oct, and the long weekends with a national holiday. We will answer any question you have.